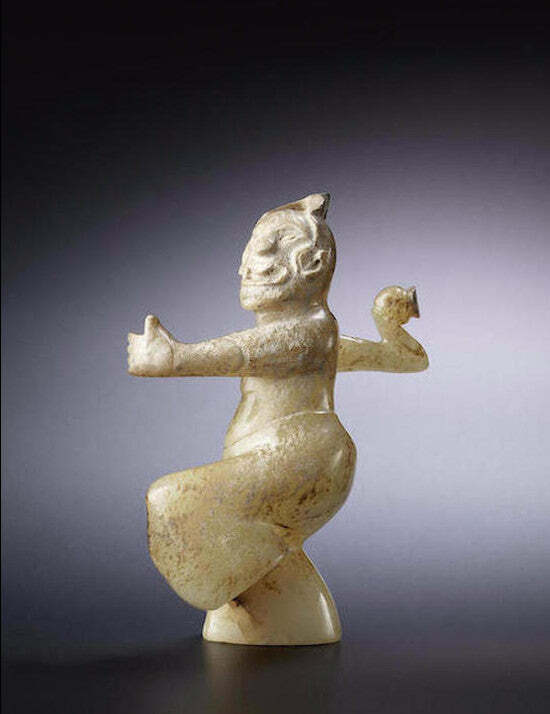 A Chinese green jade figure of a dancer realised $4m in Bonhams' sale of the Sze Yuan Tang collection. It set a new world record for a piece of jade at auction. The statuette was produced in the era of the Eastern Han (25 AD-220 AD), China's second imperial dynasty. Dancers were among the main entertainers in the Imperial court, often incorporating martial arts and gymnastics into their routines. Other lots included a grey and black jade carving of a Chimera, which sold for $3.1m. The piece also dates to around the time of the Han Dynasty and displays the exceptional attention to detail characteristic of the period. Jade has been revered in China since the Stone Age. It represents immortality and was highly prized by rulers throughout history. As Chinese buying power has increased, its value has risen substantially. Asaph Hyman, Bonhams' international head of Chinese art and ceramics, commented: "The enthusiasm for this exceptional collection proven by the multiple world record prices realised, demonstrated the robustness and depth of the Chinese art market." Further indications of the strength of the Chinese market were revealed in Hong Kong yesterday, with record sums achieved by a blue diamond and a painting by Zhang Daqian.